Once again, Signs By Benchmark is embarking on an exciting collaborative project with Rose City Canopy & Sign Inc. – this time creating a custom integrated monument sign that will provide community signage built to reflect unique neighborhood characteristics. 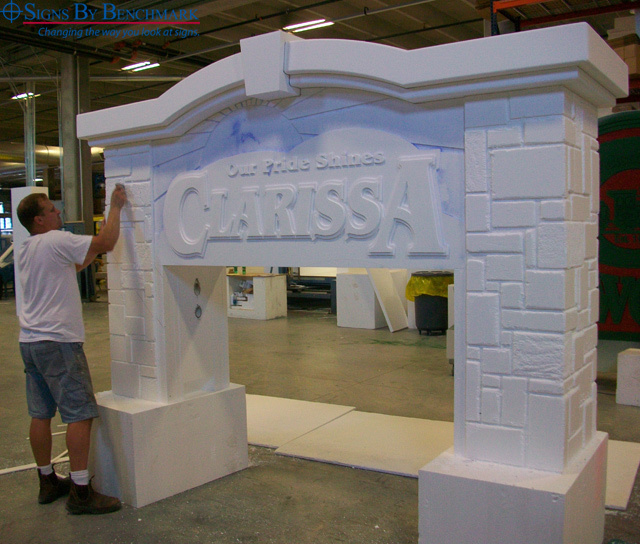 The 10′ wide x 8′ 8 1/2″ high x 36″ deep sign will feature a Daktronics message center and faux stone base and columns. Double-sided, the monument sign will certainly add to the community’s charm while visually grabbing visitors! Signs By Benchmark products are manufactured from cellular plastic. CNC or hand-cut, the sign components are assembled, then hard coated to form a solid, strong, durable unit that resists extreme weather conditions. Due in part to the flexibility of its medium, custom signs are truly Signs By Benchmark’s niche, but the wholesaler also offers a variety of affordable, standard models that can be created as specified, or customized to suit individual customer needs. And don’t forget that even though Signs By Benchmark is known for exterior signs, its skilled craftsmen also create custom interior signs that make it easy for sign shops to offer their customers a complete exterior/interior signage package. To get a good idea of what Signs By Benchmark offers, visit its photo galleries where you can view exterior and interior signage photos, then browse examples of sign accents such as bases, pole covers and sign tops. To learn how Signs By Benchmark products are made, click here to watch production and durability videos. Give the team a call at 800-658-3444 or 605-886-8084 to discuss your upcoming projects, then enjoy a successful collaboration that will provide your customers with complete satisfaction.